Doctor Doom to Star in a Movie! In the second-best news a Fantastic Four fan could possibly hope to hear — the best would be that the film rights to the franchise have returned to Marvel — signature villain Doctor Doom will star in his own live-action movie. Even better, that flick will be made by Noah Hawley, the brilliant auteur behind FX’s LEGION and FARGO! Hawley declined to share any details about the project after announcing it at San Diego Comic-Con during his panel centered on LEGION. 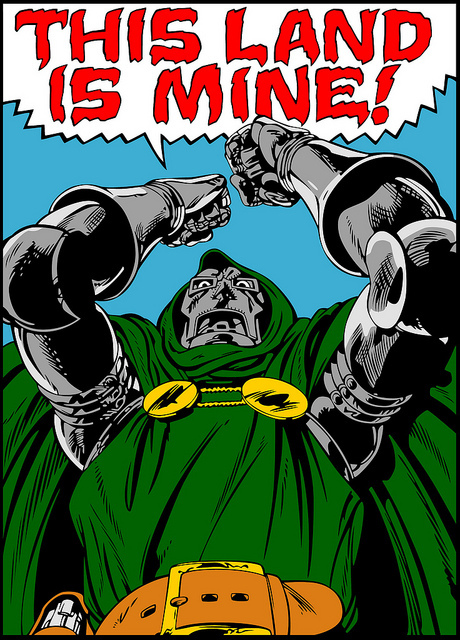 Doom is the arch-enemy of the Fantastic Four — Mr. Fantastic, Invisible Woman, Human Torch and Thing — and his character has been butchered even worse than the superheroes’ in 20th Century Fox’s previous FF movies. Face it, True Believer: He is the classic Marvel villain! In the comic books, Doom is more of a tragic figure, the misguided ruler of the fictional European nation of Latveria who was horribly scarred by his own experiment in college. In the Fox movie universe, Doom is depicted as a hanger-on to the title quartet who just happened to be mutated in a bad way while the others got to be heroes. Ugh.